Neurosis’ SCOTT KELLY is currently performing with Hamlet at the Oregon Shakespeare Festival. The vocalist/guitarist plays the part of one of the Gravediggers, peasants or commoners that use their great wit and intellect to get the better of their superiors, other people of higher social status and each other. 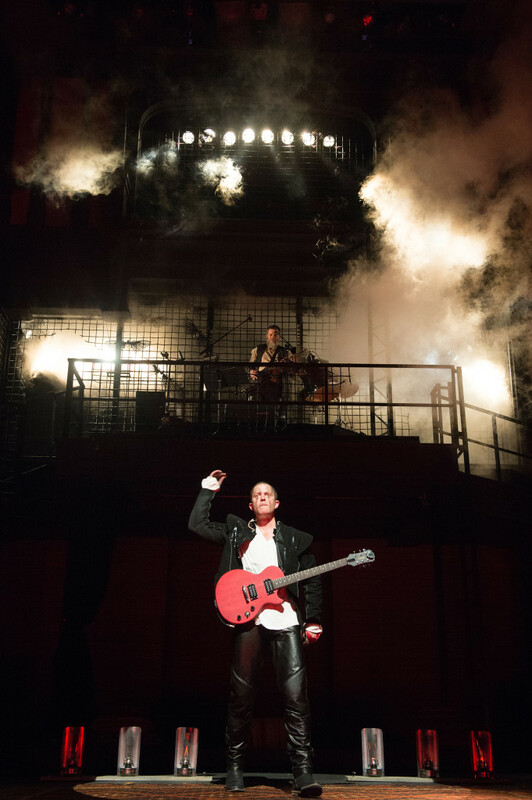 In addition to his role as Gravedigger, Kelly remains onstage for much of the performance’s duration playing music that serves as a soundtrack for the entire show and ultimately providing the sonic landscape for Hamlet’s psychological journey. “This is an adventure for me,” KELLY reveals. “I have never scored a film or a play before and I've always wanted the opportunity to do so. Thanks to my employers of the last sixteen years, I am realizing this dream. Hamlet is an incredible ghost story about the darkest internal process. This production is amazing, the actors are some of the best at their craft in the world, and the director, Lisa Petterson, is nothing short of visionary. My co-collaberator, Paul James Prendergast, is one of my favorite people and it was his idea to bring me into this whole thing. I hope that as many of you who can be here will be here to share in this unique experience." Hamlet is a tragedy written by William Shakespeare sometime between 1599 and 1602. Based in Denmark, the play dramatizes the revenge Prince Hamlet is called to wreak upon his uncle, Claudius, by the ghost of Hamlet's father, King Hamlet. Claudius had murdered his own brother and seized the throne, also marrying his deceased brother's widow. The spectral accusation torments Hamlet’s troubled mind, driving him to avenge a crime that may or may not be a product of his own imagining. Grand in scope, rich in language, this classic story of haunting, both literal and metaphorical, Hamlet is Shakespeare's longest play, and is ranked among the most powerful and influential tragedies in English literature. The Oregon Shakespeare Festival is a not-for-profit professional theatre founded in 1935. The season runs from February through early November. OSF has three theatres: two indoor stages, the Angus Bowmer Theatre and the Thomas Theatre, and their flagship outdoor Allen Elizabethan Theatre where Hamlet takes place. OSF offers eleven different plays that include three or four by Shakespeare and seven by other classic writers, as well as modern and contemporary work and world premieres. The OSF mission statement: "Inspired by Shakespeare's work and the cultural richness of the United States, we reveal our collective humanity through illuminating interpretations of new and classic plays, deepened by the kaleidoscope of rotating repertory." Hamlet plays twice a week through October 14th (note: KELLY will not appear in performances from Augutst 8th – 22nd as he will be touring Europe with NEUROSIS). For further info and to purchase Hamlet tickets visit THIS LOCATION.